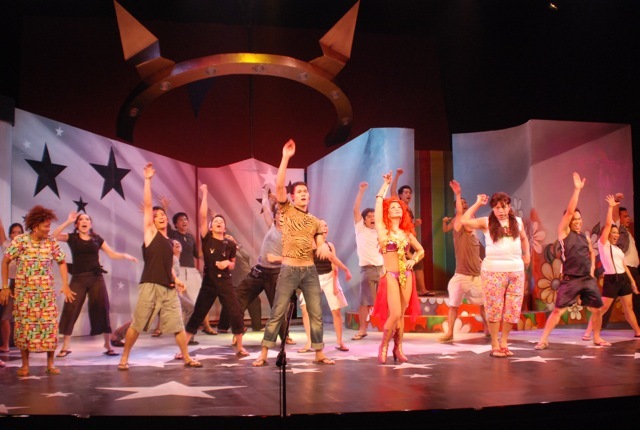 Tanghalang Pilipino concludes its 24th Season with the power-packed return of its longest running, award-winning original musical comedy. ZsaZsa Zaturnnah Ze Muzikal…Vack With A Vengeance! 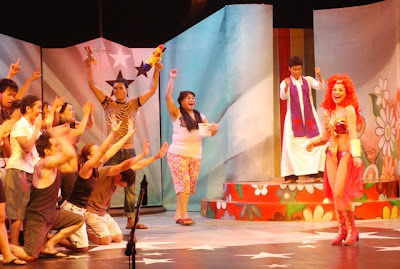 (the production’s 7th run) will be staged at the Tanghalang Aurelio Tolentino, Cultural Center of the Philipines, on February 18 to March 13, 2011. Note: Because of unforseen incident in CCP (technical malfunction), some shows were cancelled. So this play is extended on March 19 only at 3pm & 8pm. 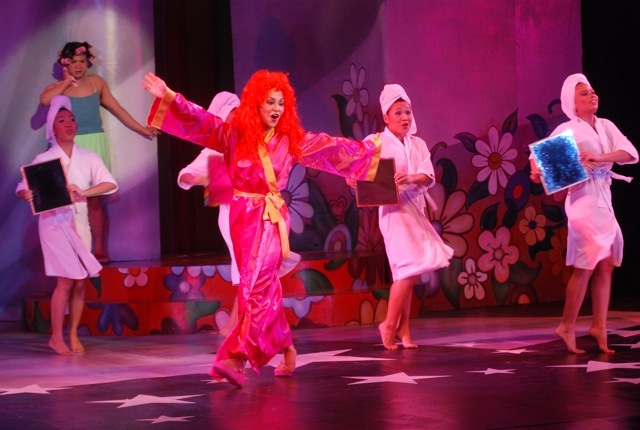 The production is bound to leave audiences rolling in the aisles again with its zany, madcap and gender bending brand of musical comedy. Eula Valdez reprises her award winning role as the redhaired super heroine. 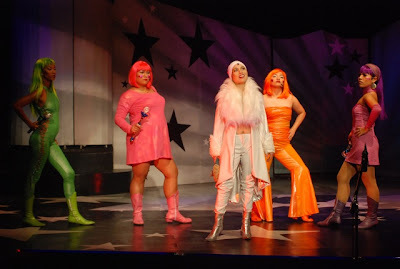 She will be joined by new cast members Gabe Mercado (alternating with Joey Paras) as Didi, her frilly mouthed assistant; Pinky Amador (alternating with Kalila Aguilos) as Queen Femina Suarestella Baroux, Zaturnnah’s fashionista archnemesis; Rocky Salumbides (alternating with Arnold Reyes and Red Anderson) as the hunk with a heart, Dodong – Zaturnnah’s object of affection. 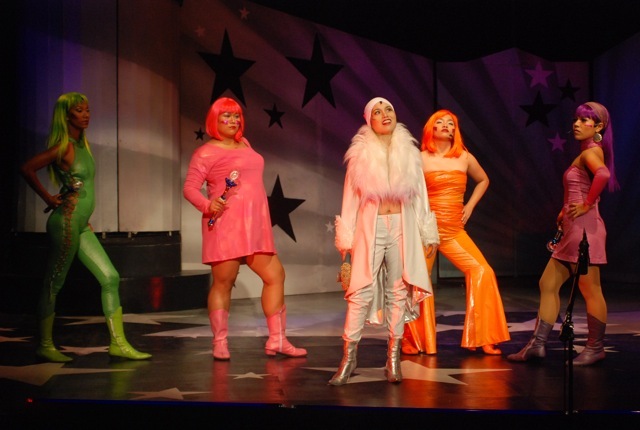 I will miss the following actors who were part of this hilarious musical play since its first run during the first quarter of 2006 until 2009: Ricci Chan (Didi), Nar Cabico (Didi), Agot Isidro (Queen Femina). K Brosas portrayed Zsazsa in 2007 run but I wasn't able to watch her performance. They also did a marvelous performance but not coming back With A Vengeance! 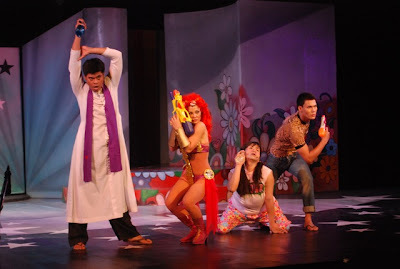 The rerun also reveals a new set design by Gino Gonzales and lighting design by Katsch Catoy. ZsaZsa Zaturnnah Ze Muzikal follows the misadventures of Ada, a gay beauty salon proprietor who transforms into the voluptuous superhero(ine) ZsaZsa Zaturnnah. Zaturnnah saves her town from marauding zombies, powertripping fashion forward aliens and a giant dancing frog. ZsaZsa Zaturnnah became an underground cult classic when it first appeared as a graphic novel, Ang Kagila-gilalas na Pakikipagsapalaran ni Zsazsa Zaturnnah (The Spectacular Adventures of Zsazsa Zaturnnah) penned and illustrated by Carlo Vergara. The piece was brought to the attention of Tanghalang Pilipino by stage director Chris Millado for inclusion in their Theater Season. The graphic novel was adapted for the stage by Chris Martinez for Tanghalang Pilipino with Vincent de Jesus creating the words and Chris Millado directing the musical theater staging. Since its opening in 2006 ZsaZsa Zaturnnah Ze Muzikal has attracted a growing, diversified and returning audiences while garnering rave reviews from mainstream critics, bloggers and from word of mouth. The 95th performance in March 2011 makes ZsaZsa Zaturnnah Ze Muzikal the longest running musical theater production of Tanghalang Pilipino and arguably the longest running show in Philippine musical theater. Tickets are now available at the CCP Box Office and TicketWorld outlets nationwide. For general ticket inquiries, call TANGHALANG PILIPINO at (632) 832-3661 or (632) 832-1125 local 1620/1621.